The NBC variety show opened with Kenan Thompson playing representative Elijah Cummings. Thompson's Cummings asked those in the hearing to stay professional and to not "ooh and ah" if they heard something outrageous. "This is not 'Married with Children,'" he told the crowd. (CNN) — “Saturday Night Live” took on the biggest story of the week by tackling the congressional hearing of President Trump’s former lawyer, Michael Cohen. The NBC variety show opened with Kenan Thompson playing representative Elijah Cummings. Thompson’s Cummings asked those in the hearing to stay professional and to not “ooh and ah” if they heard something outrageous. “This is not ‘Married with Children,'” he told the crowd. 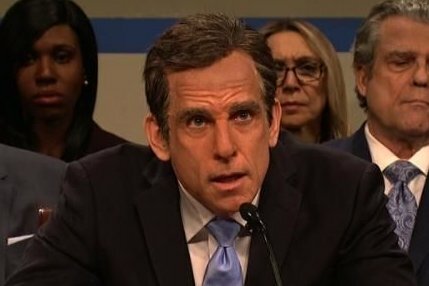 “SNL” then brought out actor Ben Stiller to play Cohen, who opened the hearing by reading a prepared statement. The hearing proceeded with members of Congress, including a very angry Jim Jordan played by Bill Hader, asking questions of Cohen. As the hearing went on, members of Congress kept yielding their time back to Hader’s Jordan so that he could continue making Trump look bad by questioning Cohen. But after a round of questions, Thompson’s Cummings had enough and wrapped up the hearing. “I am shutting this down right now so I can give a quick sermon and call everyone in this room a damn fool,” Thompson as Cummings said. But before he could do that he asked if Stiller’s Cohen had any final remarks. “Look, maybe I’m not a good person, maybe I’m a liar, maybe I’m a fool, maybe I ruined hundreds of people’s lives…,” Stiller’s Cohen trailed off. “I’m sorry, but is there a ‘but’ coming?” Thompson’s Cummings asked. This content was republished with permission from CNN.